Radios come in all shapes and sizes and with so many different features and configurations available it can be tough finding the one built to satisfy your needs. Whether you want a pocket radio for your daily jog, a portable radio for your next camping trip or one that will be the focal piece of your home entertainment center, we’re going to lay out the details on what to look for in your perfect match. If you are an avid broadcast radio listener, you will want the best reception possible. In general, bigger means better. The more space a radio has inside for a bigger antenna, the more stations you will find and at a much greater distance. If you’re going on a 3-mile day-trek in the woods, you’re not going to want a massive communications receiver in your backpack. Conversely, you’ll probably need more than something with a 2-inch speaker to fill your living room with quality audio. The first choice is for people on the move or someone with very limited space. Pocket radios can be as big as a paperback book or as small as a wristwatch. As the radio gets smaller, a sacrifice has to be made for features and functionality. You probably won’t find too many good quality pocket-sized units with a full-function keypad or a high definition color display. They exist, but they cost as much and sometimes more than the bigger radios. The next category is what can be called the “middle ground”. Portable radios can range from something you can comfortably toss into your purse all the way up to massive “boom boxes”. Anything that can be run on batteries and you are willing to carry with you to where you’re going can be considered portable. This group also has some of the best reception capabilities available due to their ability to be adjusted easily. They are, in simple terms, the best of both worlds. The third group contains the work horses of consumer radios. Devices that would fall into the table-top category have all the bells and whistles anyone could ever want and even some nobody will ever need. They plug directly into the wall for their power and have extra connections for external antennas, speakers, controllers and accessories. They come with remote controls, multi-line digital displays, built-in keypads and multiple dials for every function available. Some even come with connections for hooking up to a home computer for added flexibility. These are where you will probably spend the greatest amount of money due to their complexity, but since their capabilities are far more advanced, you’ll be getting what you paid for and more. The fact that some portables can be used as table-top radios gives them a great advantage when searching for the right one. You could leave it plugged into the wall for daily (or nightly) use, but you could then take it to the back yard for a family cookout. Where the radio will ultimately live and find its heaviest usage is a massive factor in choosing its size, function and capabilities. Many of the larger radios wouldn’t be able to sit comfortably on your bedside stand, so we’ll start by finding where you’re going to use the radio most. Once you have a better idea of where the radio will be, you can then make a more informed decision on the radio you want. Most companies will have the dimensions of the radio either right on the box or at least detailed somewhere on their website. This will give you a chance to see if it really will fit on your side stand or that little shelf in the bathroom where your wife keeps the potpourri. As you look through the specifications of a particular radio, it may have only one band, just a few or a huge selection of them. You’ll likely never find a radio that contains all the bands, so choosing which you will use most and focusing on those few will narrow your search to a much smarter selection. Bells and whistles, knobs and buttons, colors, shapes and styles. We all want radios for specific listening reasons, but how you make it get to where it’s supposed to be can run the gamut of combinations. The amount of functions you want in a radio will depend greatly on its size. Many smaller radios sacrifice external controls or an external speaker for higher audio quality or a larger antenna. Even though they are relatively new technology, digital streaming radios, also more commonly known as internet or WiFi radios, are quickly becoming more popular, especially with younger, more tech savvy users. Streaming media can be found all across the internet, and people are discovering that these streams are much clearer and easier to listen to than the radios of yesteryear. The chances are better and better as time progresses that the station you listen to is already streaming their broadcast on the internet, so it doesn’t matter that you’re in your concrete basement workshop that gets horrible reception. Anywhere you can receive an internet connection, whether wired or wireless, is where you can put these digital streaming radios. Some models will only get internet streams while others can connect to a home media server and play your own personal music collection. They may not be exactly what you’re looking for right at this point in time, but a quality media streaming device could very well take the place of your favorite radio in the very near future. Setting a budget for a new radio isn’t unheard of today, what with the multitude of different radios available. Do you want to spend just enough to get a couple of the features you need, or go all out and get your dream rig all at once? It’s worth working out what your budget is before you even start looking so that you can narrow your choices before spending money on something you don’t really like. Radios with a lower price tag will usually have fewer features, and sound quality will be diminished when compared to larger, more expensive units. You may even want to include a little extra in the budget for accessories like headphones, cases, antennas, AC adapters or batteries depending on which type you’re looking for. The perfect radio would already come with all the accessories you need, but the perfect package doesn’t always exist, so we have to plan ahead to get the biggest benefit. Everyone has experienced some type of emergency situation where communication with the outside world has been severed by one method or another. Tornadoes, hurricanes, earthquakes, flooding and other natural disasters happen no matter where you are, so being able to get information before, during and after these events is critical for the survival of you and your family. Emergency radios can save your life. You won’t always have access to electricity, and they fill the communications gap when all other power is out. They have multiple power choices, such as alkaline or rechargeable batteries, crank generators, 12-volt adapters (for use in vehicles) and, more recently, built-in solar panels. They will generally have your standard AM/FM radio bands, but what really sets them apart is the weather band. Broadcasts on the NOAA weather frequencies keep you abreast of news and critical information regarding your immediate location and surrounding areas. 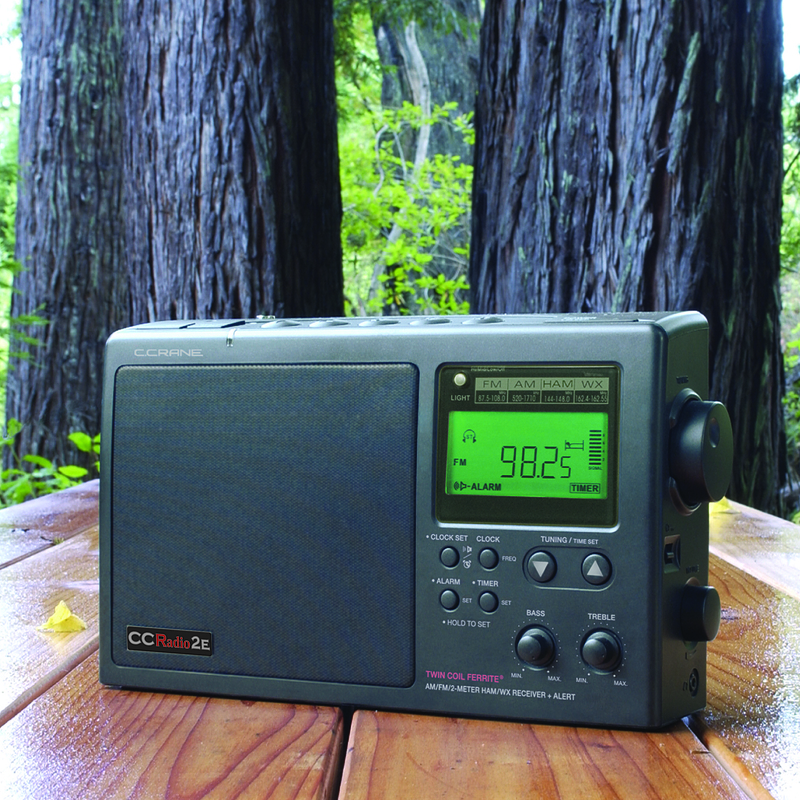 Finding the right radio for you may seem intimidating, but it doesn’t have to be. Once you know where and how your new radio will be used, as well as what you will ultimately be listening to the most, you can begin to find out just which radio will fit the bill the best. Also, it never hurts to ask for assistance. The staff at C. Crane have decades of accumulated and combined knowledge regarding radio in all its forms. If you’re stuck, give us a call. We are here to assist you with any questions you may have.